This little skirt has been an idea in my head for a while. I was browsing fabric at Hancock Fabrics and spotted this little peg doll print fabric (designer is Heather Ross). I was super excited that they were carrying some of her fabric and I just thought it was so fun and whimsical. I bought some with no project idea, but then it came to me. To make a little skirt with a house on it for peg dolls. 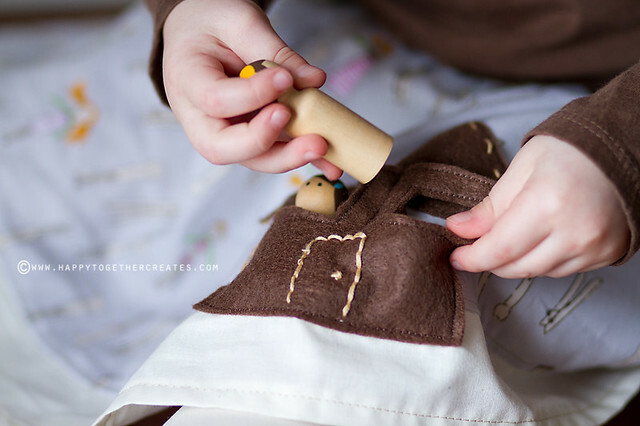 I couldn’t find the clothespin looking like peg dolls like on the skirt, but I found some that work for my miss E. Then, I received an email from the so very talented Kelly of Sewing in No Man’s Land inviting me to join in a 12 Skirts of Christmas series. I knew this skirt would be the perfect thing to do for it! It was so much fun to see my little girl discover the little dolls in the skirt. She was just excited about getting a new skirt at first. She has hit a stage where she likes to spin with a skirt on and say she’s a “barina” aka ballerina. It’s so cute. It will be interesting if she takes to it. Miss J had no interest in that kind of stuff at all. 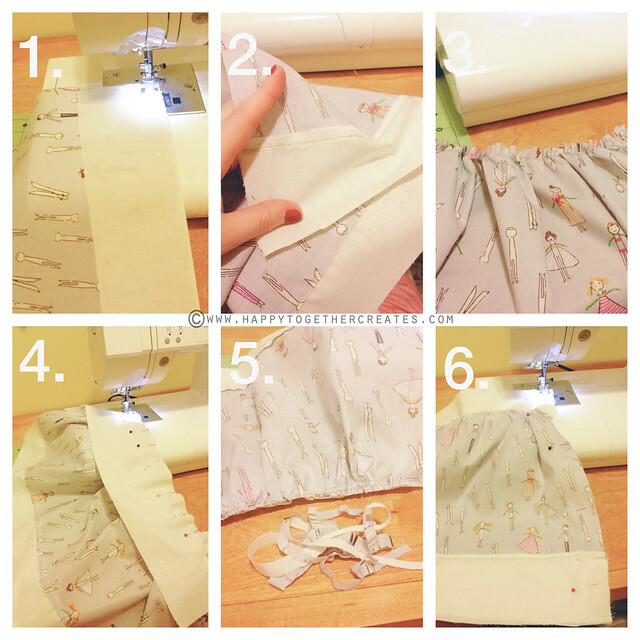 You can use any fabric you want to make the skirt and for the house, you just need some type of non-fraying material. I used felt, but originally had wanted to use some type of leather. I just didn’t have time to go around looking until I found some I liked. I had tried wool felt, but the kind I had was just too thick for what I wanted. If you want to embroider some on the house, you will need thread and an embroidery needle for that. And of course, 1″ elastic for the waist. So get your sewing machine, scissors, ruler, pins, a safety pin, and iron ready to go too. Here is how I came up with the measurements to use for a size 3. 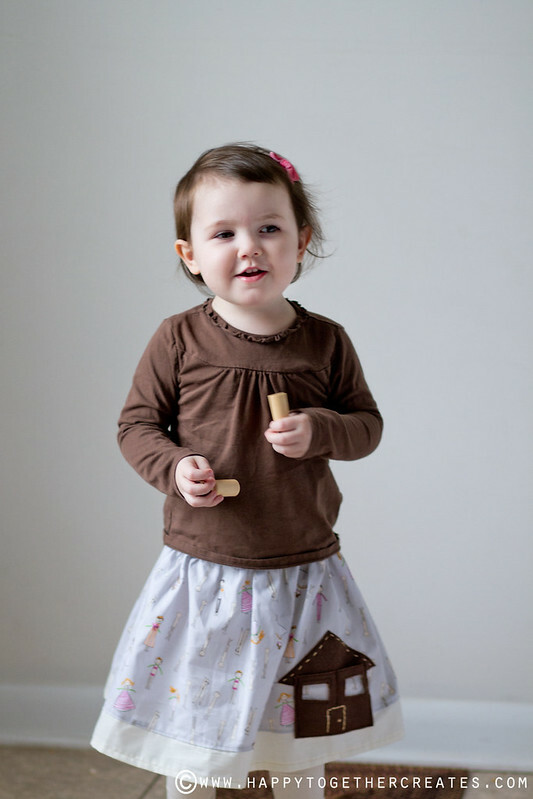 If you are making one for a gift, the Children’s Place sizing guide is great for measurements. Just use the waist measurement they give and the skirt length as your guide. They only offer the waist measurements for ages 3 and up, but for smaller sizes I would just go one inch down for each size down until at the size you need. No matter what size, the width should be 4″. This makes it big enough to create the casing for the elastic. For the length, simply add 10″ to waist measurement and divide by 2. This will be the length needed. Ex: (21″ + 10″)/2= 15.5″. For the width, just use the skirt length measurement giving on the chart. For the length, you want it to be a few inches less than double the length of the waistband piece. I say less than a few inches, because many times when I do double it exactly I find it too thick when gathered up. This would be the same length as the previous skirt piece, just not as wide. *Remember to pay attention to any pattern that is on the fabric. You want it facing the correct way. 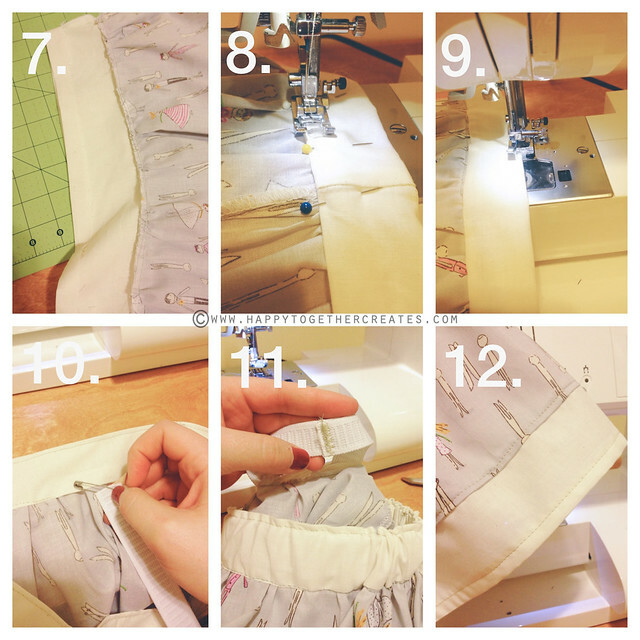 *Use the measurements you create to determine the yardage you need to make a skirt. *I use a 1/4″ seam allowance when sewing. 1. Take one bottom skirt piece and pin it to the bottom of a main skirt piece, right sides facing. Sew together. Repeat with other bottom and main skirt piece. 2. Finish the raw edges with a serger or a v-stitch/zig zag stitch. Push the seam up and sew right above seam on the main skirt fabric piece to hold in place. 3. Baste the top of each skirt piece across the top. Gather each side by pulling the bottom (bobbin) thread. Gather it until it is the same length as the waistband piece. Knot loose threads on each end and even out the gathers. 4. Place a waistband piece on top of gathered skirt, right sides facing, and pin in place. 5. Sew together and trim off extra fabric. Repeat for other side of skirt. 6. Place the now two skirt pieces together , right sides facing, matching up the seams. Pin and sew down each side. 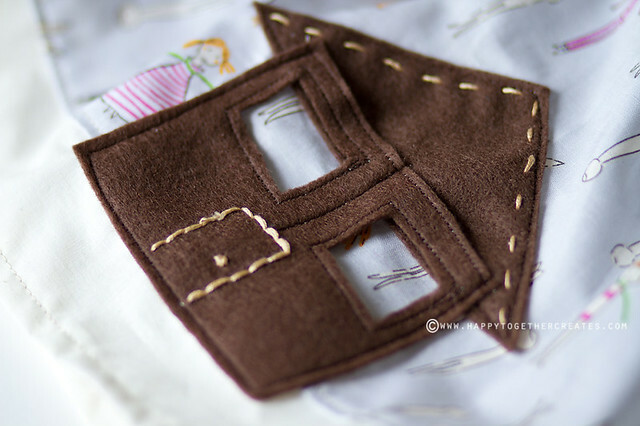 Finish raw edges with serger or v-stitch/zig zag stitch. 6b. (Not shown) With skirt still wrong side out, turn bottom up around 1/4″ and iron. Turn up about 1/4″ again and iron. 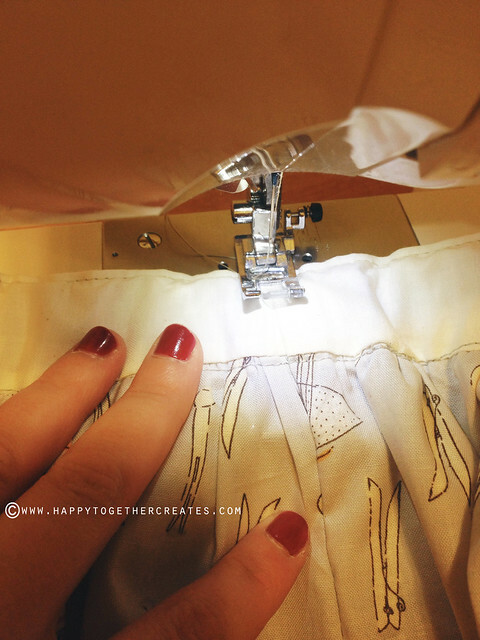 Sew around to create the hem. 7. With skirt wrong side still facing out, fold down waistband 1/2″ and iron. 8. Then fold down waistband so that it goes past the top seam a little bit. The waistband needs to be able to fit the 1″ elastic in it, so don’t put the waistband fold too far down. Sew very close to the bottom edge of the waistband, leaving a 4″ opening when sewing for the elastic to go in. 9. Top stitch very close to the edge of the top of the waistband all the way around. This will help keep elastic from twisting and moving as much. 10. Place a safety pin on end of elastic. Push it in opening and pull all the way through. 11. Once through, sew two ends of elastic together. It’s best to overlap them no more than an inch and use a zig zag stitch. 12. Push elastic into casing and sew opening shut. To help keep elastic in place even more, turn skirt right side out and sew elastic in place at one of the side seams. You can do both, but make sure to even out the elastic before sewing on the other side. You don’t want the skirt to look lopsided. 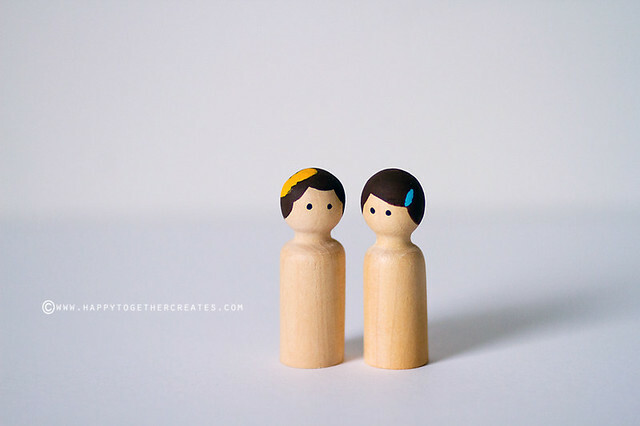 Use wooden dolls of your choice to create sizing for a house. I just made sure it was wide enough for them to fit and tall enough so it could have windows. I sewed the roof on the skirt first. Then I top stitched across the top of the house piece and around the windows for extra stability. I also added a some embroidery. And lastly sewed the house part so it went overlapped the roof a little bit. Paint dolls if you like. We kept it simple. One was painted after miss E and one after miss J. Thank you so much Kelly for hosting this fun series! Don’t forget to follow along and see what all the other creative bloggers share. There are many great sewers on the list 😉 Happy sewing everyone! Thank you 🙂 I recently just switched from blogger to wordpress so I’m still learning a lot myself. I would suggest working with a designer you like that can help work out issues. It seems some themes aren’t always compatible in each browser.